ST. JOHN’S, Nfld (September 20, 2010) – Two disabled Canadian Forces heroes, severely wounded in the war in Afghanistan, beat all expectations – including their own – in the rugged five-day, 2,000-kilometre Targa Newfoundland international car rally when they drove their Acura TL SH-AWD performance sedan to a first-place finish in their class, seventh-place finish in their division, and won a Targa Plate for successfully completing each of the 40-plus stages within tough targets for Targa times. Master Corporal Jody Mitic and Corporal Andrew Knisley competed in the Targa Newfoundland rally to raise money for the Soldier On Fund, a trust fund of the Canadian Forces established to improve the quality of life of ill and injured soldiers through active participation and peer interaction in fitness and sports. Both men suffered devastating injuries in combat that have left the pair with just three arms and one leg between them. They credit the Soldier On program with contributing to their remarkable recovery. Mitic and Knisley have prosthetic lower limbs and drove an Acura TL SH-AWD performance sedan (sponsored by the Acura Dealers of Canada) in the grueling week-long event. The car was showroom stock with the exception of rally timing components, high-performance Michelin tires and Motegi wheels, and added safety features such as a roll cage. Both drivers credit their Acura TL with its Super Handling All-Wheel Drive (SH-AWD) system for providing the performance and reliability they needed to overcome the challenges they faced and mistakes they knew they made. The two soldiers hope the money they raise for the Soldier On Fund can help injured Canadian Forces personnel to not only enhance their rehabilitation through participation in sports and physical fitness, but to achieve some of their life’s dreams irrespective of their injuries. The team is encouraging Canadians to contribute to Soldier On through tax-deductible donations made to the organization’s website, www.SoldierOn.ca. 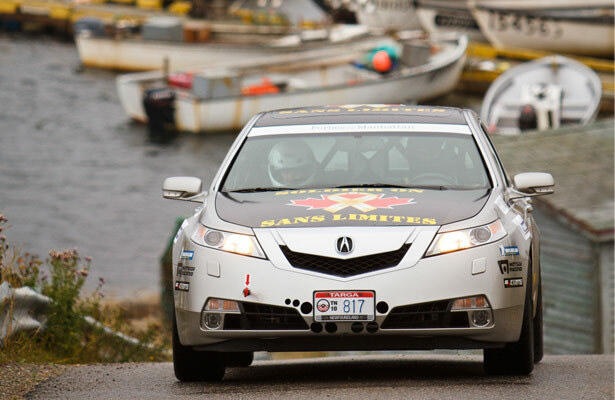 Targa Newfoundland is one of three internationally recognized Targa rallies. Multi-day endurance contests, Targa events use a series of timed, closed-road, high-speed special stages where each vehicle competes against the clock as well as against other vehicles to determine class and category winners. Targa events take their name from a motoring competition first staged on the Italian island of Sicily in the early 1900s. Targa means plaque or plate in Italian – the award for success in an event. The other recognized international Targa events are staged in Australia and New Zealand. Mitic and Knisley logged their week-long adventure on a blog (AcuraSoldierOnatTarga.blogspot.com) as well as on Facebook (Acura Soldier On at Targa Newfoundland).